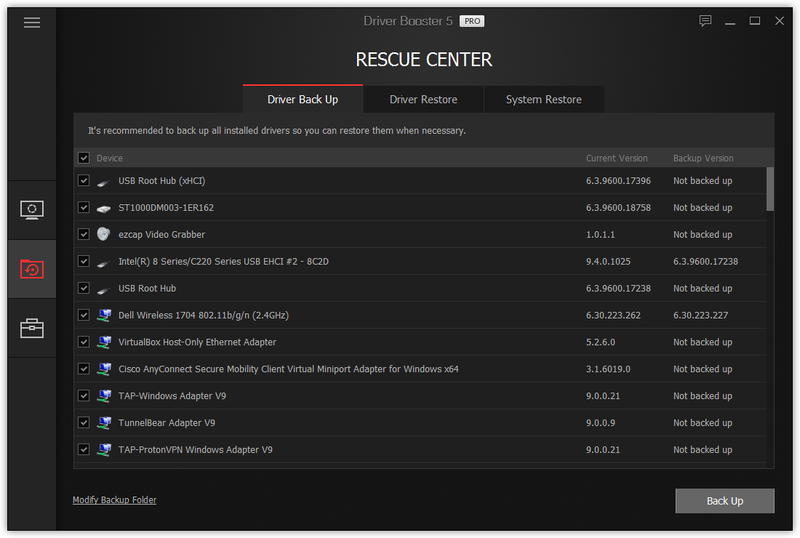 Driver Booster Pro is by far my favorite driver updater program. The software is from IObit, a company with lots of awesome free and paid software. This device driver updater can automatically find new drivers and even update them for you, which is something not all driver updaters support. In fact, some driver download websites or tools will only tell you what needs updated but won't download or update the software like Driver Booster Pro will. Driver updates are downloaded at max speed and it always seems to find all the outdated drivers on my computer. When it's time to update them, just click one button and they'll be downloaded and installed for you. It doesn't just find driver updates, though, since it also supports updating game components like DirectX, Microsoft Visual C++ Redistributable, PhysX, etc. Tip: See how Driver Booster Pro compares to the free version for more info on whether you should buy it. Important: Save $5.74 on Driver Booster Pro with the 2019pro 25% discount code. Just be sure to choose "I have a discount coupon" at checkout to enable it. When you first open Driver Booster PRO, the program will immediately start a scan for outdated drivers. Click the big SCAN button if it doesn't start. Scans are always super quick when I use Driver Booster PRO. Then, the program will list all the drivers that could be updated. You can immediately begin updating all the outdated drivers when you click Update Now. Or, you can pick individual drivers instead to only update specific ones. Pick the Update button next to the one you want updated. Note: I recommend you update all the outdated drivers that Driver Booster PRO finds. It's important to have new, clean, updated drivers for your hardware. If you don't want all of them updated, just uncheck the ones that should be skipped this time around (you can always install them later). However, it might be wise to check the details of the drivers before you update them. It's super simple to do that in Driver Booster PRO. Just right-click the device and choose Details... from the menu. As you can see below, you can very easily compare the currently installed driver and the new one that Driver Booster PRO wants to replace it with. There's a version number, date that the driver was released, and publisher. Right-clicking a device also lets you roll back the driver to the previously installed version (something good to do if the current driver isn't working well), uninstall the driver completely, back it up, or ignore the driver so that the program won't ask you to update it again. The right-click menu also includes an export option so that you can save the list of driver updates to a TXT file. This is great if you're sharing the details with tech support. From the Rescue area on the first page of the program (off to the left like you see here) is where you can back up your drivers so that they can be restored again later if something unexpected happens and the driver causes issues. If the device acts strange after an update, go to the Driver Restore area of this screen to restore the backup. I really like Driver Booster PRO because it's so easy to use. The design and interface isn't confusing and it's a practical way to update drivers from a clean and reputable source.